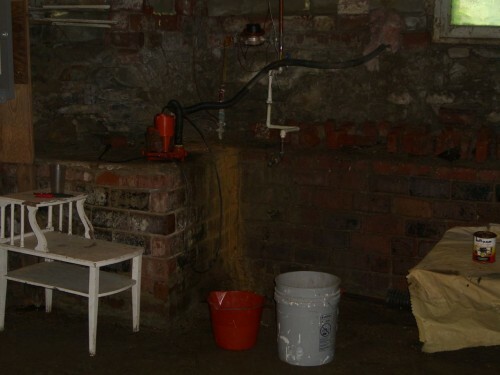 While standing in the basement during a rain storm the other day (checking to see where seepage was worst – as expected it’s near where the gutters have problems and water puddles near the house) I heard the sump pump come on and glanced over to see it in action. Turns out the hose, which the previous owner mentioned was getting near needing to be replaced, had a few small holes in it – on the basement side of the wall. I watched bemused as the table and bricks to the right of the pump got a shower, then switched of the breaker and went in search of a new hose. First off, I need to learn to look closer at things. The pump manufacturer says this is a 1.5″ outflow, so I bought a 1.5″ hose. You’ll note that the old hose (below) is attached not to the pump directly, but to an adapter of sorts that I can only assume makes it 1.25″. Anyway, with some extra tightening of the screw clamp the new hose fit fine. This is your sump pump after who knows how many years under water. 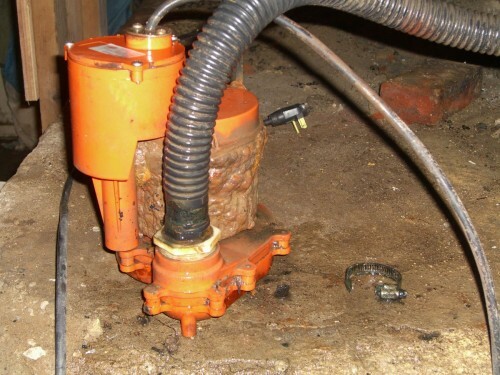 This is your sump pump hose, cleaved to the adapter even after the clamp is removed. Unfortunately, upon securing the new clamp, turning the power back on, and resubmerging the pump, it did not… pump. Some light surgery revealed that either moisture had finally gotten in to the power housing and corroded the connections or something was wrong in the motor section which I can’t access due to severe corrosion and buildup around the screws holding the main housing. Long story short, $110 at Lowes got me a new pump and a one way check valve that allowed me to connect the hose to the pump. Filed under basement. You can follow any responses to this entry through RSS 2.0. You can leave a response, or trackback from your own site.